1. Harry Potter and the Forbidden Journey – What starts off as a nice little walking tour through the halls of Hogwarts ends up in a thrill ride that will have you screaming with a combination of fear and joy. You end up soaring above the castle grounds as spiders, dementors, and a whole series of magical creatures come and go before your very eyes. The ride is a little scarier than you might expect from a Harry Potter ride, so use caution when taking the little ones on. 2. 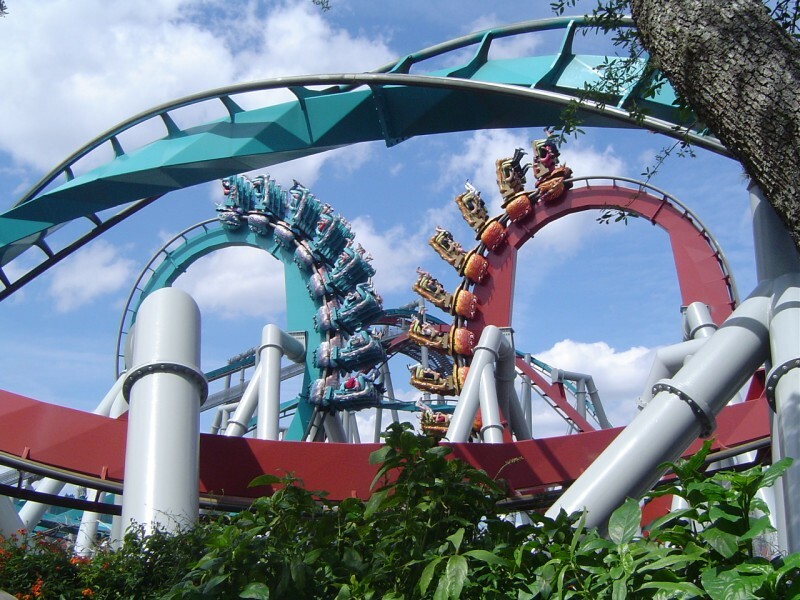 The Incredible Hulk Coaster – Most rollercoasters take you on that interminable ride to the tope before dropping you off at a great speed, but not this green behemoth. The Hulk coaster gives you the impression that you are about to endure that exact same experience, but then pulls the rug out from under your feet. You enter a tunnel during the climb, come to a complete stop, and are then basically launched from 0 to 40 mph in a matter of seconds. You barely have time to catch your breath before hitting twists, turn, and loops that are simply just awesome. 3. The Amazing Adventures of Spiderman – This ride employs a stunning use of 3D that totally immerses you in the ride. You little travel car never leaves the ground, yet you feel as though you are falling off of tall buildings, being spit on by the Green Goblin, and all manner of other delicious little 3D treats that make this one of the best rides in the park. 4. Jurassic Park River Adventure – While this ride may seem a little dated compared to some of the newer ones, it still delivers a massive thrill punch at the end. A leisurely river cruise through Jurassic Park quickly turns sour due to an electrical failure. Before you know it, animatronic dinosaurs are snapping at your heels, led by T-Rex of course. I don’t want to give too much away, but prepare for a big scare and a drenching at the end of this one. 5. Hollywood Rip Ride Rockit – The perfect ride for the music lover in the family, and one which allows you to star in your own music video. You choose the song that you want played during your ride before being launched 17 stories above the park at a gut-wrenching 65mph. The cameras are rolling during the ride, which you can then use to create your own music video at the end. This is a rollercoaster that can make you a star and turn you into jello, all in under 2 minutes.